I’ve just returned this past week from a trip to New Zealand with Arturo Toledo. We were invited to come by Nigel Parker, who if you live in New Zealand and don’t know him…take a moment and subscribe to his site for information about what’s happening in that area. Our first stop in New Zealand was the WEB09 conference, which was organized by John Ballinger. Prior to the actual conference, John managed to get all the speakers together for a reception and then a dinner afterwards. Within those 4 or so hours of time, I’ve met more iPhone developers in one space than I have ever known. Seriously, I’m amazed at the creativity and entrepreneurial spirit of the New Zealand developer/designer community. Allow me to take a moment and mention some of the applications/developers I met. I’m sure I missed some, but these were the ones I could remember quickly. It was cool to hear stories about how (and why) these folks are developing in the iPhone space. At a reception with Cactuslab, I had great conversations with a lot of folks, especiall Dan. It was there that I learned I should probably at least try a feijoa fruit and do the touristy thing and go to Burger Fuel. The conversation, of course, was a lot better than just that – I promise. Cactuslab is also where Karl (who is also the author of Charles) works and they had just launched a fun (and make fun of) site around Microsoft Songsmith. Who is Robert Songsmith? You! Grab a copy of Microsoft Songsmith, put some Cure on your headphones, sing along and send them your recording. 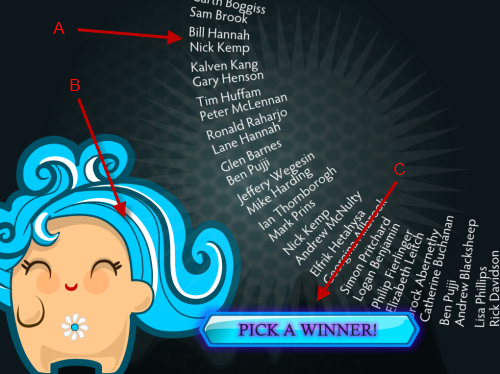 For the 2 days of WEB09 this became a bit of a cult following…well maybe not a cult, but we had fun talking about it. Karl is the man. The presentations at WEB09 were great. Because Microsoft and Adobe were premier sponsors, we were given opportunities to talk about our platforms in keynote addresses. The Twitter feedback channels had comments about how people were not liking the “vendor pitch” presentations. I suppose I can understand how they felt, but it’s kind of hard not to sound ‘pitchy’ when you’re asked to speak on your platform specifically. Nigel did a great presentation on something he created in 2 days that was very local and used some cool features of Silverlight and other platform offerings. I am sure Adobe felt the same way about the feedback. Of course with some friendly competition in the room, there were the occasional jabs between Adobe and Microsoft. It was all done in good fun, but probably didn’t come off that way. NOTE: If you think you’re getting feedback at a conference via evaluations, you’re wrong. While at Øredev last year I made note of the red/green card system for some statistical, but better instant visual feedback. More and more, however, Twitter is becoming an instant feedback channel. I saw more people with laptops/mobiles open with some type of Twitter client than before. Twitter: your new conference evaluation system. We were able to do a workshop the day before WEB09 started where we could talk more specifically about certain things like SketchFlow and more of the line-of-business application features added to Silverlight 3. It was a good group, with some great questions. Adobe keynote – had a good planned demonstration of a lot of things, including Flash on the Playstation. Unfortunately, most demonstrations were heavily reliant on Internet connectivity, which melted early at the conference. I feel bad in these situations because at sometime it happens to anyone who presents. I really liked the augmented reality stuff that Paul Burnett showed though. It was fun and I can see some useful things out of it as well. I heard the Soundbooth/Premiere session with Andrew Spaulding was awesome as well with real-time translation. The Open Web with Dylan Schiemann, co-founder of the Dojo toolkit. In an weird halfway-across-the-world thing…turns out that Dylan and I are actually only separated by about a few blocks at home…weird. Dylan had some great opinions of where we are with the ‘open web’ and what things are getting in the way, making it easier, etc. He’s pretty frank and entertaining as well, which made it good. Dan Rubin – did a good session on thinking about experiences differently. Pamela Fox from Google did a great session about mapping experiences and how you shouldn’t get stuck in the default behavior – differentiate your map experience for your users to provide context and relevance to the topic. 3:00 – 3:40: Determining how we’re going to tell Nigel that we’re exhausted, not creatively thinking and going to surrender. 4:00 – 4:55: I work on the code, while Arturo works on some design assets. I hand off the VS project, he opens Blend. Style’s away and we’re done. Notice the styling. The “B” is the data load button, and A/C should be obvios what they are. 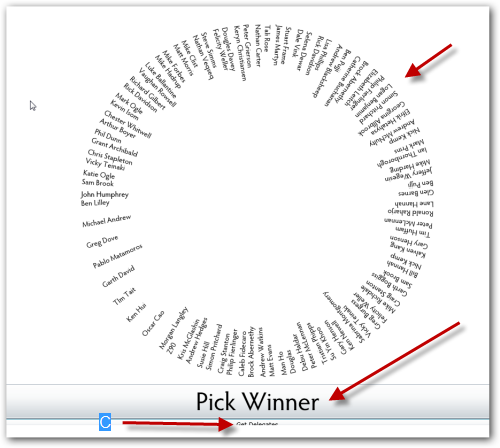 The circle actually rotates with a sort of ‘batman’ like highlight that also rotates, then picks a winner. There is some cheesy wheel of fortune remix audio that we added as well. While it isn’t production code by the slightest, it was fun to do and I think we did okay. Nigel has more and a raw video of the contest ending here. Yes, I know the code is not the best. I spent all of about an hour hacking it together. I’m aware of some of the bugs :-).